The strategic objective of the SEAFOODplus Integrated Programme is to make itpossible to reduce health problems, to prevent major diseases andto increase well-being among European consumers by using the opportunity toapply the benefits obtained through consumption of health promoting and safeseafood products of high eating quality. In order to properly address this strategic objective a fork-to-fish approach is being considered in a total chain context. While embracing the total seafoodchain production system, the following six strategic areas will be addressed,each with its specific objectives. Seafood and human nutrition: To assess theimportance of seafood in diet in relation to lowering the risk of majornutrition related chronic diseases (cardiovascular disease, colon cancer,inflammatory bowel disease) and to assess the role of seafood consumption in thepromotion of health in young European populations, including pregnant women andtheir children and in the prevention of obesity and osteoporosis. Seafood and consumer behaviour and well-being:To develop and apply an integrated approach to improving the understanding ofdeterminants of European consumers' seafood consumption in order to generatemajor contributions to adapt seafood products more to consumer demands and toasses consumer attitudes and perceptions of seafood and the impact ofhealth-related communication strategies on consumer choice relating to seafood. Seafood safety: To make seafood safe forthe consumer, by identifying risk factors, avoiding risks caused by viral andbacterial contamination and biogenic amines in seafood. Seafood from source to consumer product: Todevelop a number of consumer driven tailor-made, functional seafood products andprocesses to improve health and to ensure nutritional quality and safety in aconcept of full utilisation of raw materials from aquaculture production andfrom traditional fisheries. Seafood from aquaculture: To study theeffects of dietary modulation, husbandry, aquaculture systems, fish physiology,genetics and pre-slaughter conditions on the farmed seafood qualitycharacteristics in order to meet the challenge of finding a compromise betweenthe current trend towards intensive rearing and increasing consumer demand forhealthy, high quality seafood that is produced in ways that are ethicallyacceptable with a low environmental impact. 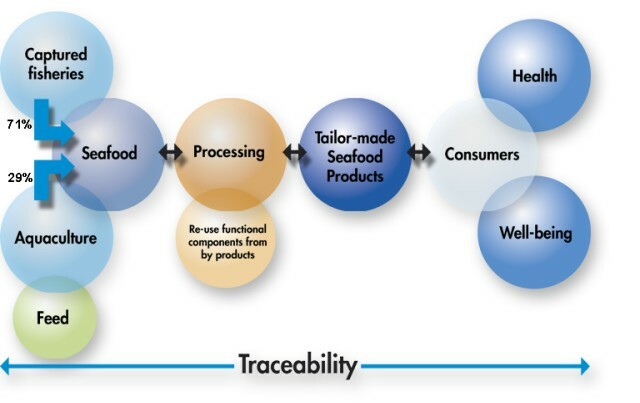 Seafood traceability to ensure consumerconfidence: To implement validated traceability systems in all productionsystems considered in the SEAFOODplus Integrated Programme in order to make itpossible to span the total chain from the live fish to the product when it isbeing consumed, and to trace back any feature from 'fork to farm'. The total number of partners involved in SEAFOODplus is more than 70, and the total number of research projects over the six strategic areas of research is 20.